I have been using a simple backpack recently, but it doesn’t offer the organisation that a changing bag does and I miss that. 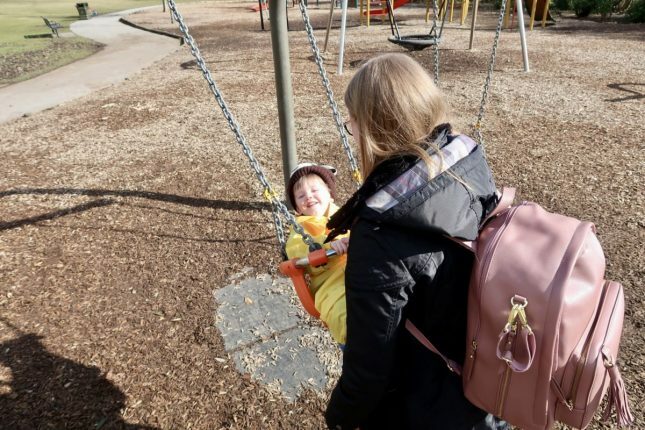 With baby number 2 on the way I knew I’d need something a bit more practical, so I was please to be sent the Skip Hop Greenwich backpack to try out and see if it works for 2 kids. As soon as I saw the backpack I was in love. 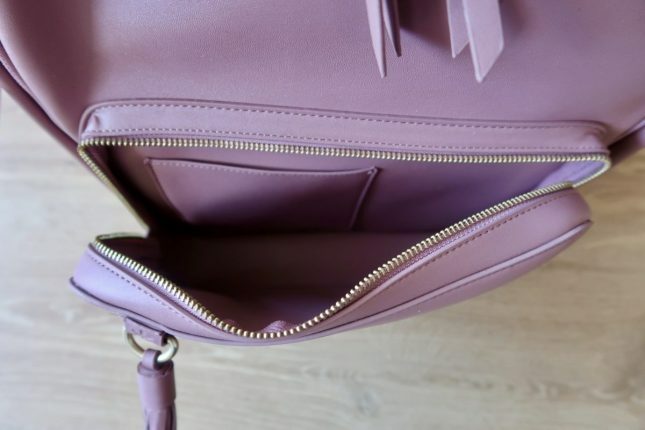 I got it in the gorgeous dusty rose colour (but there are lots of other colours available) and was drawn to how it doesn’t actually look like a changing bag. There are lots of pockets and sections to keep you organised. The main pocket is really spacious. This is perfect for a mum of two as it means I have plenty of room to fit the items for their very different needs. I always think Piglet doesn’t need much, but between outfit changes, snacks, hats and nappy change items I still need a decent amount of space. Within the pocket there are a couple of additional stretchy pockets to keep anything you want a little more contained. There is a second large pocket at the back of the bag. 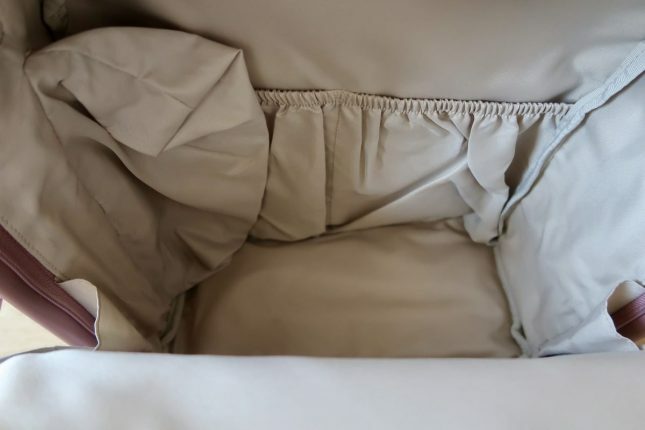 In there I was pleased to find a a thin padded changing mat – ready for changing on the go! This pocket is also big enough to hold a tablet or laptop up to 15″. Obviously this is not something we tend to carry around with us, but we already have a holiday booked for this year and will definitely be taking a tablet to help entertain Piglet on the plane so I’m happy to know it will fit and be safe in there. Along the front is a decent sized pocket where I am keeping all of my things. As I have Type 1 Diabetes I tend to carry more around with me than your average person. I have extra sets for my insulin pump, a blood glucose testing kit, sugar to treat hypoglycaemia and sometimes even insulin pens incase of a pump failure. On top of that I have the usual purse, keys, lipsticks etc – and it all fits in to that front pouch. Perfect! Down the side there is a little zipped pocket for popping a bottle in to. I think that’s a great idea as it saves you scrabbling around for a bottle when you’ve suddenly got a a hungry baby on your hands. At the moment I have found it handy to put Piglet’s water cup. The bag is made of vegan leather, and is wipe clean – just as well when there’s sticky toddler fingers around. The straps are wide and padded which means it’s comfortable to wear even when it’s laden down with lots of things. For it’s first outing we took it to the park. I kept it on my back most of the time with no discomfort at all. It comes with pram hooks so I could put it on the back of the pram when I wanted to. I was quite surprised that it didn’t pull our pram over (as Piglet wasn’t in it) like most other bags usually do. I think the weight distribution of the bag is just right to keep it steady even with a lightweight umbrella stroller. Overall I really love the bag. 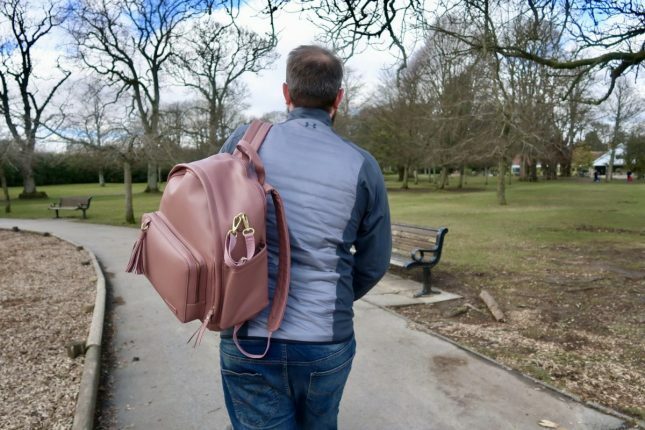 I was surprised to find that JHogg was happy to carry it too, even in pink, which he has often been reluctant to do unless strictly necessary with previous bags. Now all I need to wait for is a new baby to really test the backpacks capabilities! 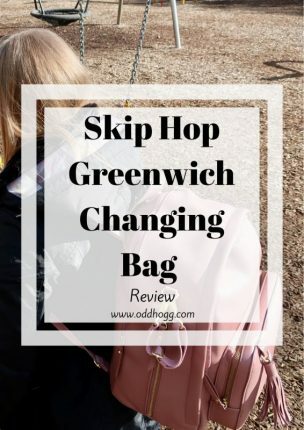 We were sent the Skip Hop Greenwich Changing Bag for the purposes of carrying out a review. All words and opinions are my own. I love the colour and the style. With my first baby I bought a tan suedette shoulder bag, I think it was a Walaboo or something like that. By the time no.3 came along a chucked everything in a big bag from Monsoon. It’s great to be able to keep everything organised though. This one is gorgeous. I love this bag – great choice with the colour and great that it has all the compartments inside for storage – it is very stylish. I’m out of the stage of needing a change bag now, but when I did I always loved the skip hop bags. Thry were stylish and practicsl and never screamed ‘change bag’. I love the colour of this one. I wish that this changing bag had been around when I needed it. I think it is far more sensible to have a changing bag in a backpack design. Like you say, it leaves your hands free and it’s better for your back too. Looks like it has lots of fab compartments too! 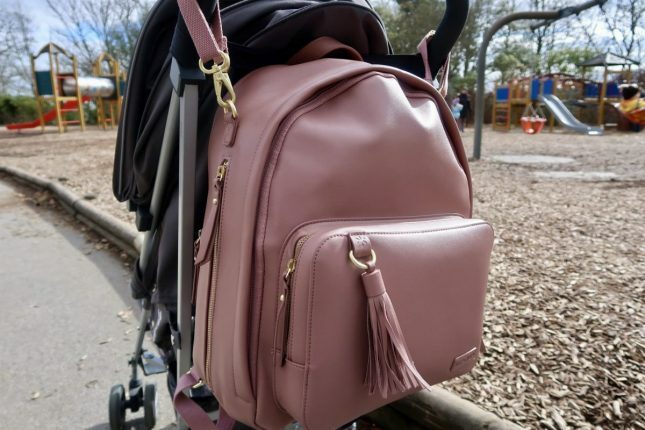 I really like the trend for backpack style changing bags – I often use a baby carrier and a backpack works so much better! I love the size of this one. You really can’t underestimate the sheer amount of stuff you need for 2 kids! My bag is huge and always full. I am desperate for a new changing bag. This is lovely and I love the fact it is a backpack – I have 3 little ones so you can imagine how much I have to carry around with me!! This looks a perfect size. I really need to upgrade my current changing bag, it’s dire compared to this one. I love that this one doesn’t actually look like a changing bag and having it on your back is really handy! I also like how spacious it is which is perfect for me as I usually take everything but the kitchen sink out with me. Oh this is beautiful! I am in dire need of a new changing bag. At the moment I am using an old rucksack. It has to be a rucksack for me because of having the two now! I love the colour too is got great longevity so pretty. I love that changing bags are becoming much more fashionable. I remember lugging around this massive bag whenever I went anywhere. I would definitely go for something like this if we have another little one.